Raster scan and random scan are the mechanisms used in displays for rendering the picture of an object on the screen of the monitor. The main difference between raster scan and random scan lies in the drawing of a picture where the raster scan points the electron beam at the entire screen but incorporating just one line at a time in the downward direction. On the other hand, in the random scan, the electron beam is guided on just those regions of the screen where the picture actually lies. Electron beam Swept across the screen and handles one row at a time and in downward direction. Directed to the portions of the screen where a picture is to be rendered. Resolution Poor, since it generates meander lines which are organized as distinct point sets. Good, as this produces even lines drawing. Picture definition Stored as the combination of intensity values for all screen points. Stored as a group of line drawing instructions in a display file. Effectively displays realistic scenes. Unable to display realistic shaded scenes. The Raster Scan is a scanning technique in graphics monitor where the electron beam is moved along the screen covering one line at a time from top to bottom. The beam intensity is set at high and low levels as the beam sweeps around the screen to generate a pattern of illuminated spots. Refresh buffer or frame buffer is then used to save the picture definition, more specifically the memory area contains the combination of intensity values for various screen points. These stored intensities are fetched from refresh buffer and represented on the screen one scan line at a time. The fundamental unit for defining a single screen point is known as Pixel or Pel (Picture element). The raster scan systems are appropriate for the realistic display of scenes as these systems are capable of saving the intensity data for each screen point where subtle shading and colour patterns can also be involved. However, the television sets and printers are examples of other systems. The capability of the raster scan specifies the intensity range of the pixel position. It requires only one bit per pixel to handle the intensity of the screen positions in a black-and-white system. On the other hand, to display the intensities of different colour variants, supplementary bits are required. The high-quality systems include up to 24 bits per pixel in which case a high amount of memory is needed to store frame buffer depending on the resolution such as in megabytes. A typical system having a screen resolution of 1024 by 1024 and contain 24 bits per pixel can consume 3 megabytes for the frame buffer. In black-and-white systems, the frame buffer is known as a bitmap where only one bit per pixel is consumed while the frame buffer of systems with multiple bits per pixel is called as a pixmap. The rate of refreshing on raster-scan displays is operated at the rate of 60-80 frames per second. The Random scan works in a completely different manner to the raster scan where the electron beam is pointed to merely those areas of the screen where the picture is to be drawn. However, it only involves one line at a time when drawing a picture that is why it is also known as the vector or calligraphic display. 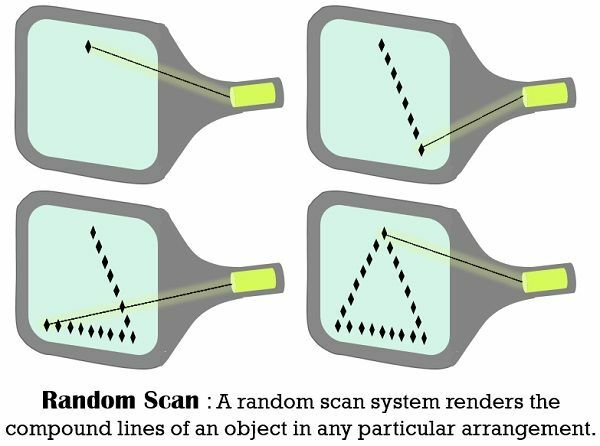 The component lines of an object by a random scan is drawn in the way as shown in the diagram below. The refresh rate of a random scan relies on the number of lines that are to be showed on the screen. Similar to the raster scan the random scan also stores the picture definition as a set of line drawing commands using some sort of medium known as refresh display file. The other names for refresh file display are display list, display program or refresh buffer. A system displays a certain picture by revoluting the group of commands in the display file and drawing each component line after each turn. After processing all line drawing commands, the system cycle is sent to the first line command. A random scan is capable of drawing all the component of a picture about 30 to 60 times per second. In the provided refresh rate the high-quality vector systems are competent enough to handle 100000 short lines. At the time displaying short lines, the refresh cycles are delayed to eliminate refresh rates higher than 60 frames per second. Otherwise, swift refreshing of the group of lines can damage or burn the phosphor. The raster scan monitors make use of the whole screen for displaying the object while in random screen monitors the certain part of the screen is used where the electron beam is projected. Resolution of random scan displays is better than raster scan. Raster scan saves the picture definition as the group of intensity measures for various screen points and consumes more size. As against, in the random scan, the picture definition is stored in the form of a collection of line drawing instructions within a display file. Random scan systems are mainly devised for line-drawing applications and are unable to display the naturalistic shaded scenes. On the contrary, a raster scan system is suitable for rendering realistic shaded scenes. However, random scan creates a sleek line drawing. 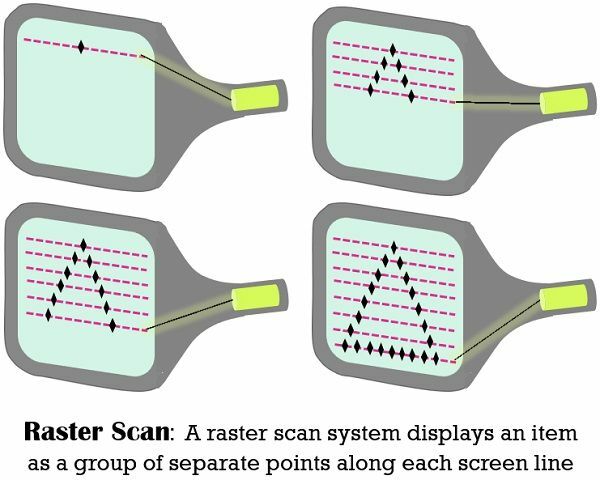 Raster scan uses screen points/pixels to draw an image whereas a random scan employs mathematical functions for painting the image. When it comes to refreshing rate, the raster scan has higher refresh rate about 60 to 80 times per second while random scan consumes less time for refreshing the screen, i.e., 30 to 60 times per second. Raster scan can also use interlaced refresh method which is not used in the random scan.